"Teaching the next generation and even the current tilers on the benifits of top quality products and systems is something we are very passionate about the new technology available today is amazing our apprentice Liam has spent the week using Laticrete products 335 Premium Flexible Adhesive and HYDRO BAN® waterproofing by far best products we have used to date thank you LATICRETE Australia and Ceramika tile gallery for supplying materials for our projects." ~ Ultimate Bathrooms. Thank you Ultimate Bathrooms for the great rap you've given us on your Facebook page. We couldn't resist - we had to share your experience and the love of LATICRETE! We love seeing projects and what you love about LATICRETE - to share them with us, please tag us in your social media posts or email them to: marketing@laticrete.com.au. 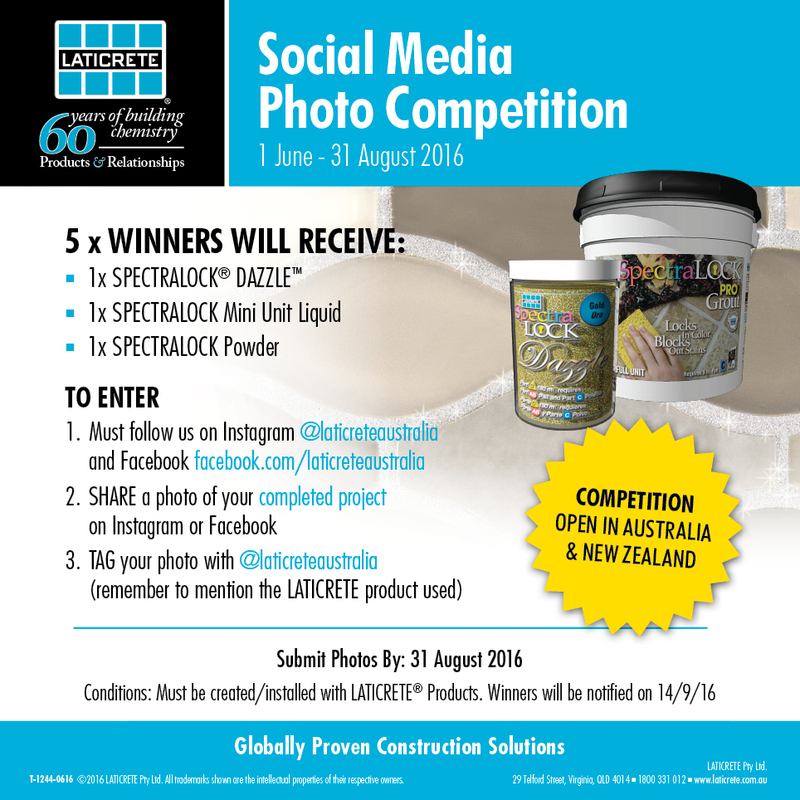 If you haven't entered our Social Media Photo Competition - make sure to enter, competition closes 31 August. 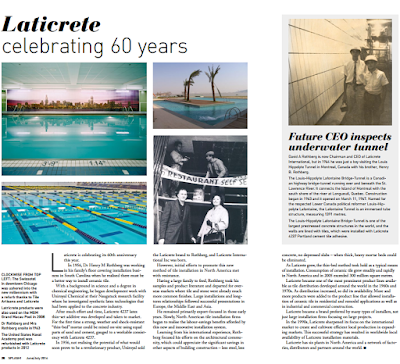 LATICRETE is featured in a number of places in the June/July Issue of Pool+Spa Mag. Check it out here! Full page advert - HYDRO BAN®, Page 11. Article on the 60th Anniversary of LATICRETE, Page 12. Product feature - Masonry Veneer Mortar, Page 27. Upcoming Profit Through Knowledge Seminars in 'Coming Events', Page 42. "Masonry Veneer Mortar provides a productive, easy-to-install, permanent, high-strength installation for adhered masonry veneer, stone and thin brick. The patented, versatile polymer-fortified mortar provides maximum non-sag performance for vertical installations and also obtains maximum bond strength to the substrate and selected veneers." "All about the silky smooth Laticrete 335!! By far the best adhesive to work with!! My go to adhesive every time." - Kurt, K Tiling and Stone. Thanks Kurt! 335 Premium Flexible Adhesive is a high performance, cement based, thin-bed adhesive for installing a wide range of tiles and stone including low absorption ceramic tile, porcelain tile, natural and manufactured stone using thin-set method of installation. Extended open time and easy to use. Excellent for interior, exterior and underwater applications, 335 Premium Flexible Adhesive has superior bond to masonry, and exceeds the requirements of AS4992.1 & AS4992.2 classification C2TES1. Click here for more info. Following on from our blog LATICRETE gets behind TAFE training Craig Hunter, LATICRETE NSW Technical Sales Rep, and Fred Gray, LATICRETE Technical Service Manager, were invited back to Sydney Randwick TAFE to provide training and share their knowledge on LATICRETE materials and to discuss tiling standards. Craig and Fred spent some time in the classroom with the first year students explaining the classifications of adhesives. The students then had the opportunity to get their hands dirty with mixing up 345 Platinum. With the aid of some perspex tiles, students got to see the benefits of back buttering tiles. Want to arrange a demo or customised training for your team? Recently LATICRETE provided customised training on LATICRETE tile and stone installation systems to the team at Bayset in QLD. The LATICRETE Technical Sales Reps, Warren Miller, Mitchell Haw and Fred Gray the LATICRETE Technical Service Manager, discussed products and had the group participate in hands-on demonstrations. LATICRETE is committed to educating and providing technical support and advice. We provide customised in-store and job-site training and demos for your team, as well as trade events, provide samples, and customised specifications for YOUR project! For more info on our upcoming LATICRETE Seminars and Trade Events check out the Seminars page on our website, or keep up to date by following us Facebook. Can we interest you in a trade event or customised training workshop for your team? Call us on 1800 331 012 or contact us here. WOW - what a bathroom! Brock Barber from Creative Tiling was the inspiration behind this wow project. You may ask, what makes it glow? Your answer - SPECTRALOCK® PRO Grout with DAZZLE™ additive, Glow-In-The-Dark! 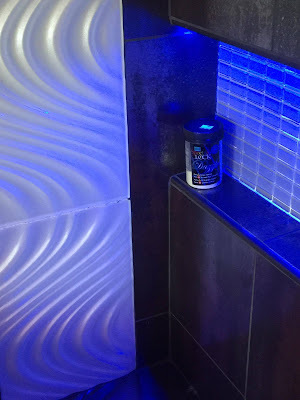 SPECTRALOCK Grout DAZZLE adds metallic and Glow-In-The-Dark enhancements to SPECTRALOCK PRO Grout. These high-end design elements offer limitless imaginative applications. Use DAZZLE on walls and floors to accentuate metallic tiles, glass tiles, mosaics, stone and listellos. Suitable for use in interior and exterior applications. Thanks Brock for allowing us to share your WOW project. Contact your local LATICRETE Technical Sales Rep for more info and to arrange a free sample. Call 1800 331 012 or email us here. Don't forget to enter our Social Media Photo Competition. Competition closes 31 August 2016. Click here for all the details! Quick, Quick, Quick - Entries close 30 July! 1. Purchase $300 or more on LATICRETE materials from Tilers Express WA on a single tax invoice, from 1 June 2016 - 30 July 2016. 2. Post, fax, or email your tax invoices. Include your name, email address & mobile number to enter into the draw. 3. 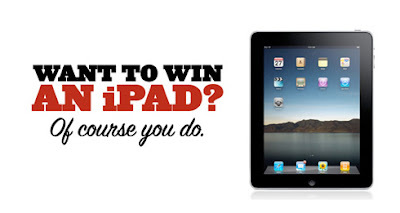 Check the WIN an Apple® iPad® Air 2 WiFi 64GB* for Terms & Conditions and how to enter. The winner of the Apple® iPad® will be drawn and announced on 22nd August, 2016. Note: Competition only open to Western Australia! For more info chat with Aaron and the team at Tilers Express WA on Tel: (08) 6388 8988 or call LATICRETE on 1800 331 012, or email your invoices here. 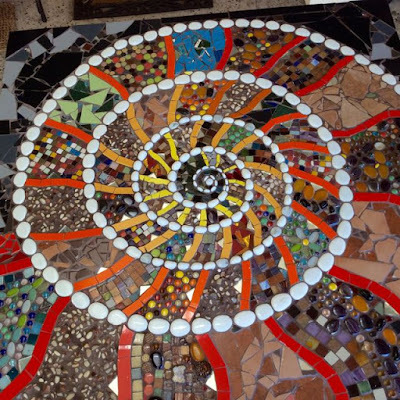 "As promised, herewith some medium quality photos of the Spiral mosaic I did with the KU Fox Valley Community during the month of June. It should be installed soon, within a custom built framework & be visible if travelling along Fox Valley Road. Thank you for getting me the Espresso Spectralock. The pack of 4 was precisely the right amount for the 1.2mx1.2m mosaic. There were several sections with pebbles and glass drops in, and this always gobbles up vast amounts of grout. This was the very first time I have used epoxy grout on one of my community mosaic projects, so I guess I took a risk by using an unfamiliar product on a job! 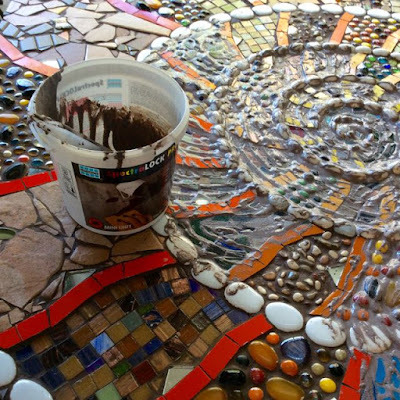 The artwork is full exterior, much of it mosaiced by a pre-school community, so weatherproofing and binding qualities were very important for the grout. 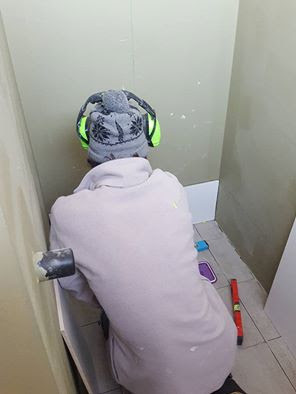 The Laticrete epoxy grout video on YouTube was very helpful, the product instructions were clear and concise, it was great to have almost everything I needed contained in the buckets (the quality of the sponges were great, by the way!) and I had no problems mixing part A & B. 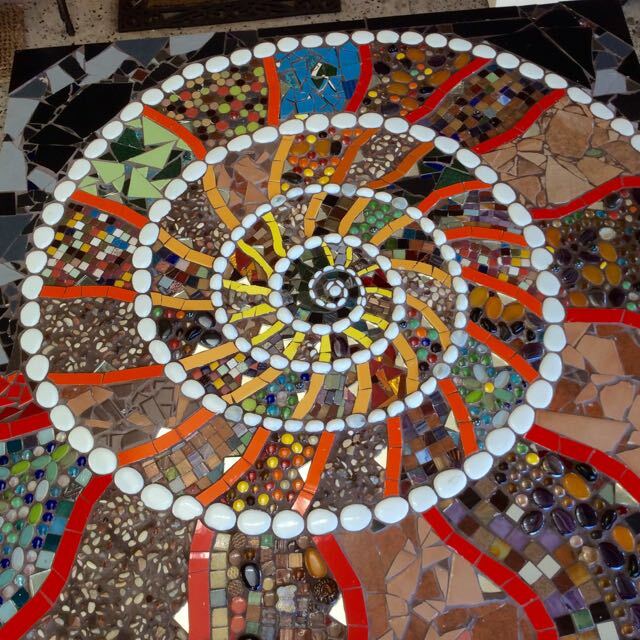 The spiral mosaic was grouted by me alone- section by section and bucket by bucket- a slow and methodical process lasting 4 hours! Although initially confused by the wet grout colour, which was a yukky grey brown when first mixed- after 30 minutes I noticed the grout went through a metamorphosis as it dried and began to set, becoming the beautiful, rich chocolate brown I visualised for this artwork. The Spectralock grout was easy to mix, apply and clean off, filling gaps big and small beautifully. I used the grout cleaner supplied in the bucket before I left for the day. 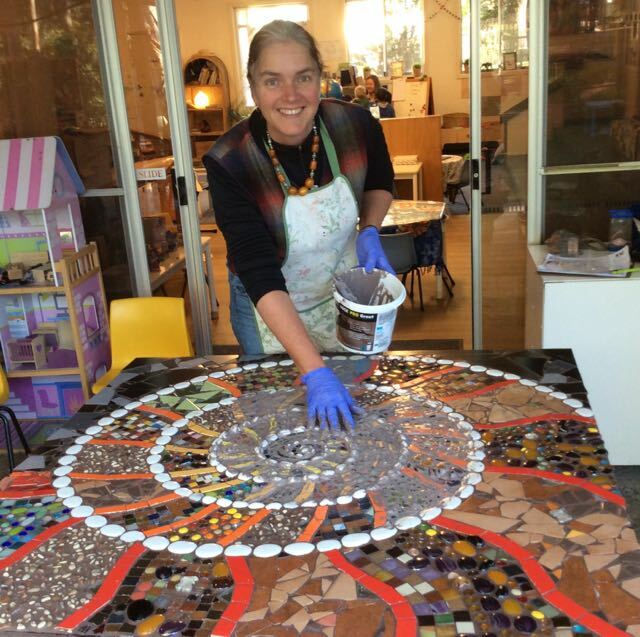 When I returned to the preschool two days later to file any sharp cut edges, the mosaic had undergone yet another stunning transformation. 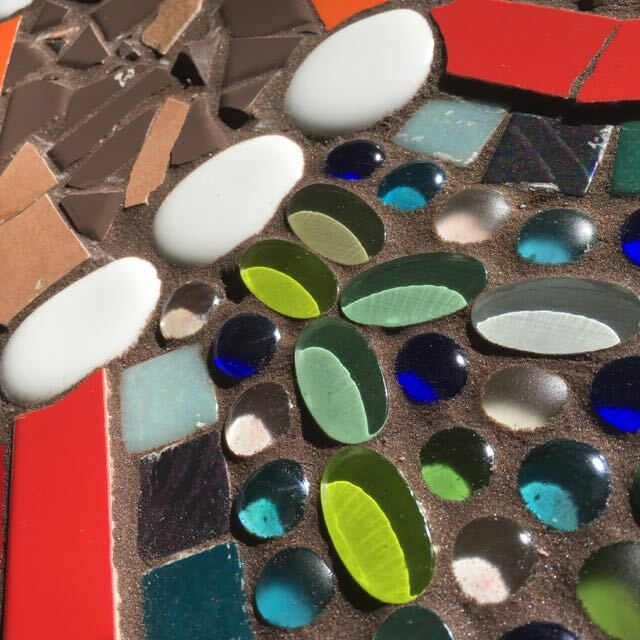 The colours of both the glass and ceramic tiles were richer and deeper and the grout, although not containing the dazzle additive, still glittered in the sun. It must be the resin in the grout that does this, but everyone who worked on this mosaic is thrilled with their finished work of art!" - Susanna Mills. Thank you Susanna for taking the time to send in this great testimonial! 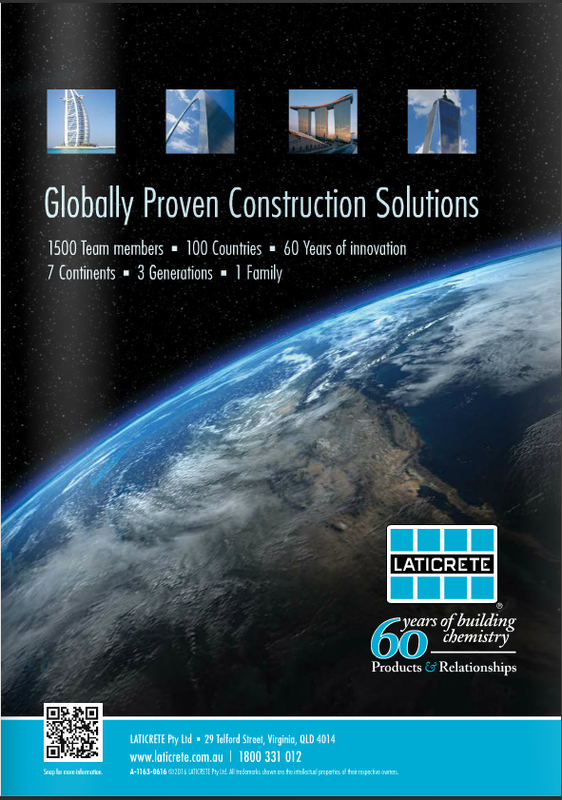 "Laticrete is celebrating its 60th anniversary this year. In 1956, Dr Henry M Rothberg was working in his family’s floor covering installation business in South Carolina when he realised there must be a better way to install ceramic tile. With a background in science and a degree in chemical engineering, he began development work with Uniroyal Chemical at their Naugatuck research facility where he investigated synthetic latex technologies that had been applied to the concrete industry. After much effort and time, Laticrete 4237 latex thin-set additive was developed and taken to market. For the first time a strong, weather and shock-resistant “thin-bed” mortar could be mixed in-site using equal parts of sand and cement, gauged to a workable consistency with Laticrete 4237. In 1956, not realising the potential of what would soon prove to be a revolutionary product, Uniroyal sold the Laticrete brand to Rothberg, and Laticrete International Inc was born." Click here to continue reading this great editorial. Call 1800 331 012 or email seminars@laticrete.com.au to book your seat. Winter has well and truly settled in for Australia and projects need to go ahead even if it's cold outside. Below is some helpful tips and hints for tiling and grouting in cold weather to ensure your projects look great for years to come. 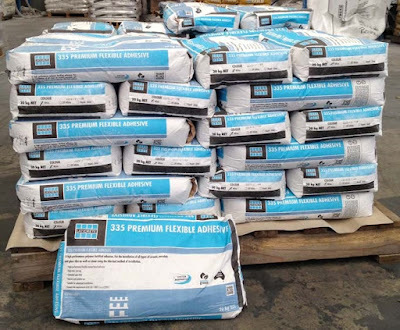 Conventional portland cement tile setting beds, thin-set mortars, grouts and cement plasters are often permanently damaged when subject to below freezing temperatures immediately after installation. The water content of a mortar turning into ice often results in portland cement gel structure rupturing with significant loss in strength, flexibility and durability. Subsequent repairs to the damaged work and resulting site delays are extremely costly. The 8ºC Rule – for every 8ºC below 21ºC, portland cement and epoxy based materials take twice as long to cure. 1. Work during warm periods of the day. 2. Ensure that the surface temperature is within the suggested temperature range for the LATICRETE product being used during the installation and cure period. Consult the individual LATICRETE product data sheet and 'How to Install' guide for more information. 3. Tent and heat areas that will be subjected to the elements or freezing temperatures during installation and cure periods. Continue reading the Cold Weather Tiling and Grouting TDS-1002 here. Contact us on 1800 331 012 to discuss your next project, arrange a demo, request FREE samples or for technical support or contact us here. "All done mate came up so nice, cheers again for the epic products" - Josh Young, J.A.Y Tiling. 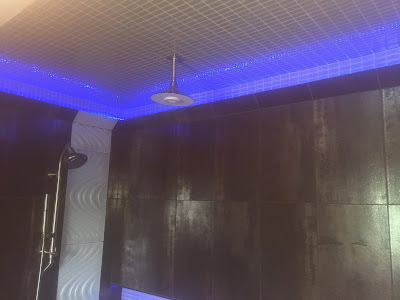 Last week we blogged on a kitchen reno project by Josh Young from J.A.Y Tiling, using STRATA_MAT™ over a timber floor. The project is now complete and the results look great! STRATA_MAT is designed to replace traditional underlayment materials. Engineered to allow safe, reliable installation of tile and stone over "problematic" surfaces such as wood, cracked concrete, post and pre tensioned concrete. STRATA_MAT can be used in both residential and commercial projects. STRATA_MAT is a lightweight product, fast to install, can be used under moisture sensitive stone and eliminates transmission of in-plane substrate cracks of up to 3mm. It is part of the LATICRETE Lifetime System Warranty. Click here for more info and to view an installation video. Don't forget to enter our Social Media Photo Competition - click here for all the details! LATICRETE Featured In June/July Flooring Mag! Latest Issue of Flooring Mag is Out Now! 60th Anniversary article, Page 5. Randwick TAFE Graduation Awards, Page 10. 'Committed to Training', Page 32. Product Feature - HYDRO BAN®, Page 42. STRATA_MAT™ full page advert, Page 49. 'Globally Proven Construction Solutions' full page advert, Page 53. "Laticrete was invited by Randwick TAFE, NSW, to sponsor a new perpetual award for Outstanding Student in the area of Certificate III in Wall and Floor Tiling at Randwick TAFE for the 2016 annual graduation evening in May 2016. The inaugural award is the prestigious Dr H.M Rothberg Trophy for Outstanding Achievement for Stage 3, for the final year of students. Students also received their much awaited TAFE certificates on the night." To continue reading go to Page 10. 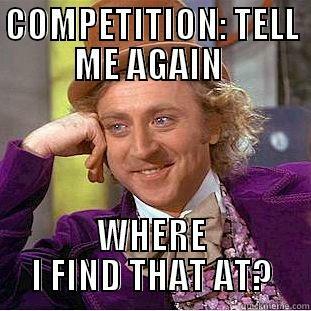 It's Competition Time at LATICRETE! 2. SHARE a photo of your recent project on Instagram or Facebook. 3. TAG your photo with @laticreteaustralia, and remember to mention what LATICRETE product/s you used. Submit your photos by 31st August, 2016. Winners will be notified on 14th September, 2016. The competition is open to Australia and New Zealand installers. Click here for more info, including the Terms & Conditions and how to Enter! 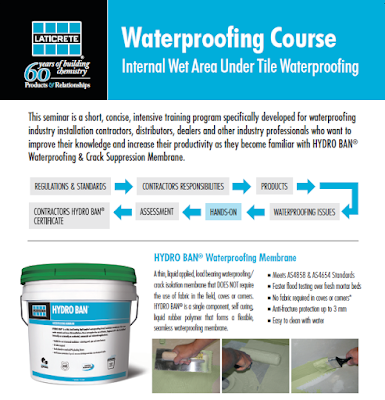 LATICRETE and Tilers Express WA will be delighted if you could attend this short, concise, and intensive waterproofing training seminar specifically developed for the waterproofing industry installation contractors, distributors, dealers and other industry professionals who want to improve their knowledge and increase their productivity as they become familiar with HYDRO BAN® waterproofing and crack suppression membrane. RSVP: Aaron (08) 6388 8988 or email: a.holdaway@tilersexpresswa.com.au for catering purposes. 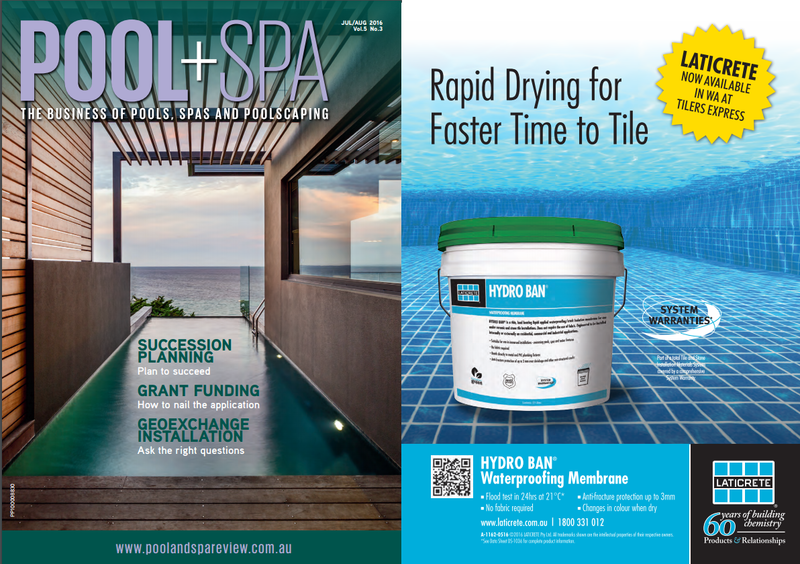 This is a great opportunity to chat with the LATICRETE Technical Service Manager, Fred Gray, about LATICRETE products that are designed to increase productivity and profitability, as well as discuss the new Australian standards for waterproofing. We hope to see you there! We would love you to come join the fun! This event is a great opportunity to chat with your local LATICRETE Technical Sales Rep, Craig Hunter, and find out how LATICRETE Systems and Warranties can turn your project into another globally proven tile and stone installation! 345 Platinum - A globally proven one-step, thin-set adhesive. Glen Beaumont from Adept Pools in NSW shared progress photos of their pool project with their local LATICRETE Technical Sales Rep, Craig Hunter. "Here's a start for a project. Product used 3701, liquid hydroban, 335 white and spectralock sterling silver. Hope you like." ~ Glen Beaumont. Thanks for sharing Glen, we can't wait to see the completed pool! 345 Platinum Now Available in WHITE!